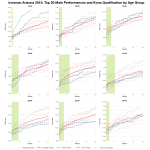 Ironman Arizona is this week’s race. 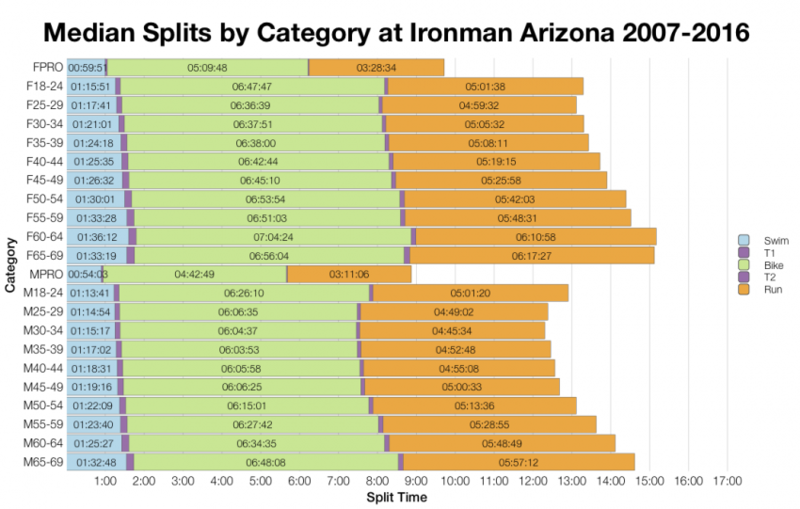 As a long standing US Ironman, Arizona draws a large field with over 2,500 athletes making the start line. It receives the standard 40 Kona slot allocation to divide among the age groups. Qualifying times tend to be highly competitive. This year’s race looks to have trended slower than usual. Every split trends slower than the 10 year aggregated data for this year’s race, the shift is enough to impact from front to back. While there are times as fast as previous years, they are fewer in number. 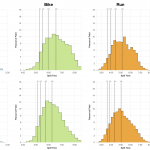 The run is most significantly affected with this year’s race being around 25 minutes slower at the median. Naturally, the impact is over 40 minutes on overall times at the mid point. DNF stats for this year correctly account for DNS so we see the low percentage of drop outs at the swim (no DNS figures included). 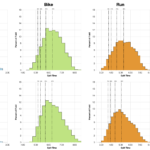 Both bike and run display higher rates of DNF than usual, pushing towards the highest levels for the course. Combined with the slower distribution this does suggest a tough year on the course. 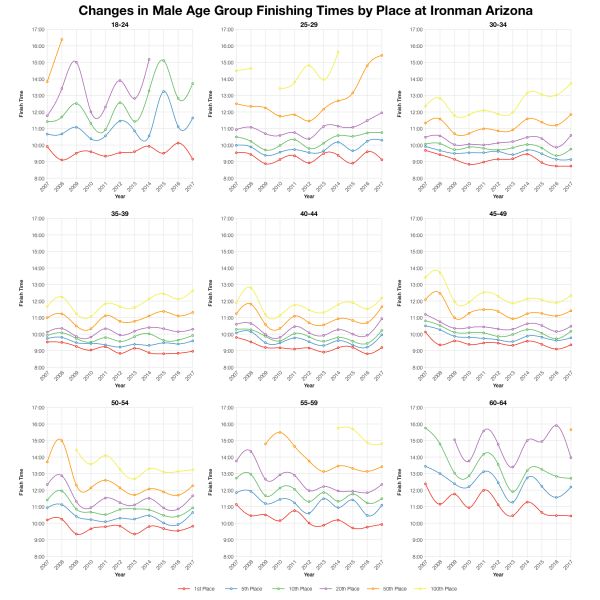 As always age group medians stats follow the trends of the distributions and we see slower median times across every age division. The same is not true of the pro stats for this years race which are comparable or faster than the aggregate data. 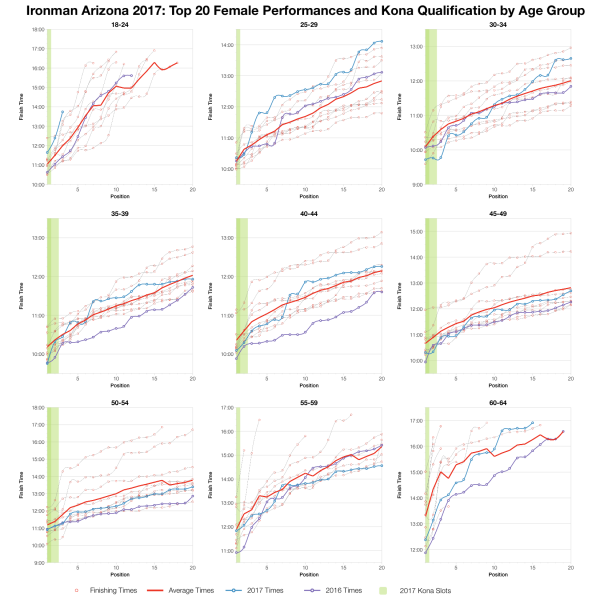 There’s the usual majority North American field for a US race, but Arizona draws a wider field and distributes Kona slots quite broadly. 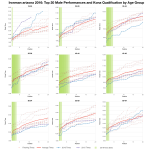 Tracking the times for specific positions within the age groups shows a definite up tick to this year’s times. As is often the case this is more pronounced further back in the field and minimal for the top position. Considering first places only, this year’s race doesn’t diverge that much from previous results, but further back times move towards the slower end of the set. 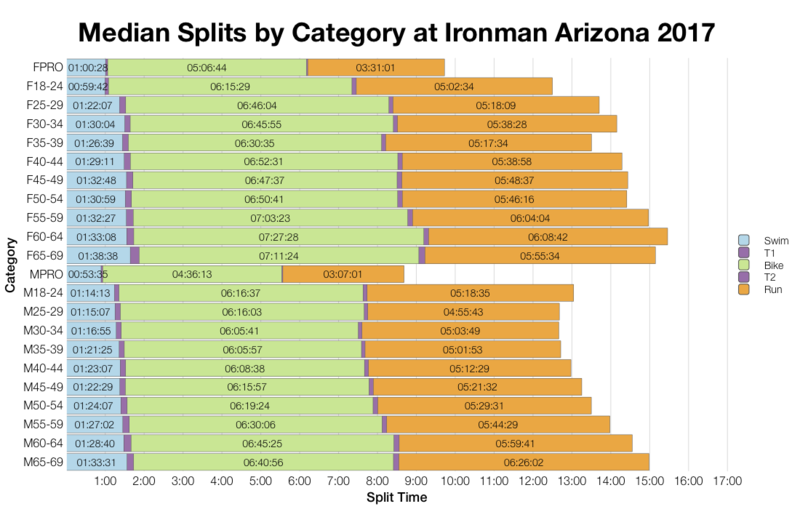 I’ve estimated the slot allocation based on the start numbers and from that calculated a final qualifier time that would automatically grant a Kona slot. Actually numbers may have varied slightly and roll down would impact final times. 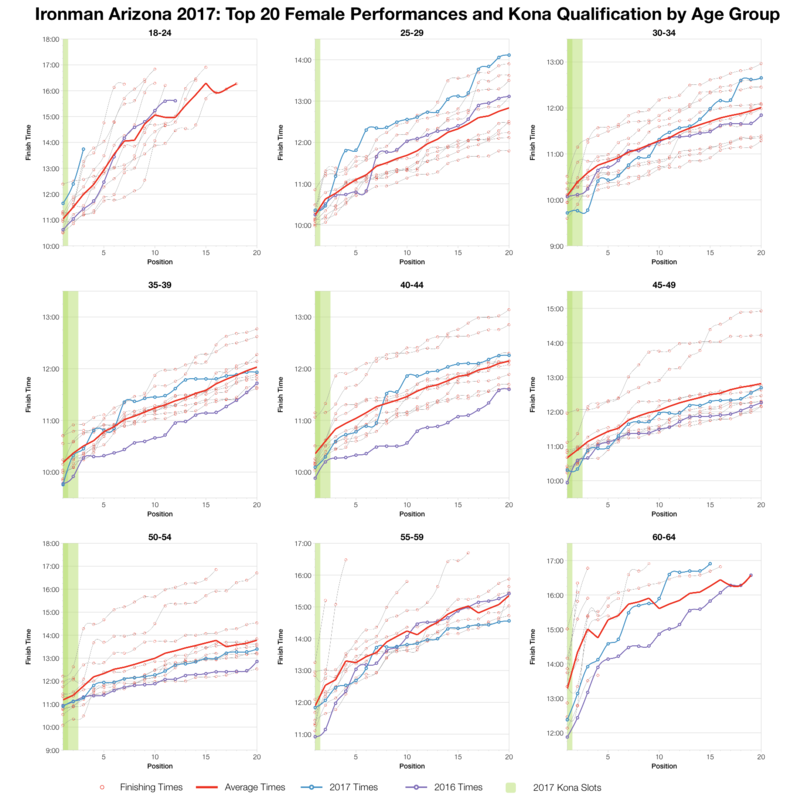 For more detailed information and comparison with other races, check out my Kona qualification page. 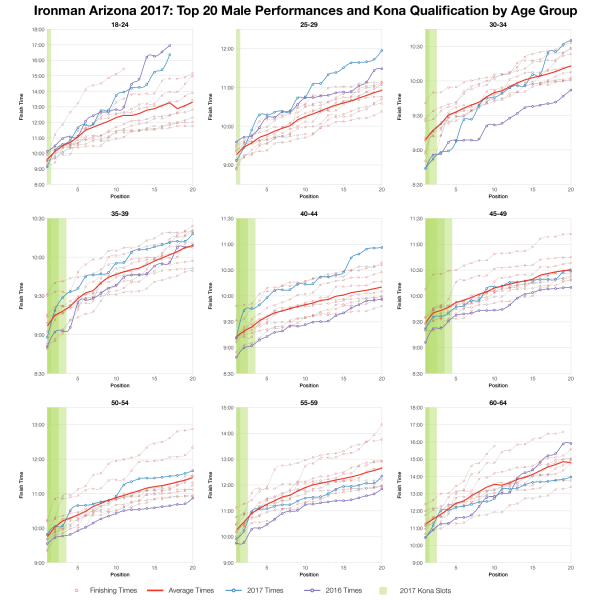 There’s a mix of performances in the top twenty of each age group. 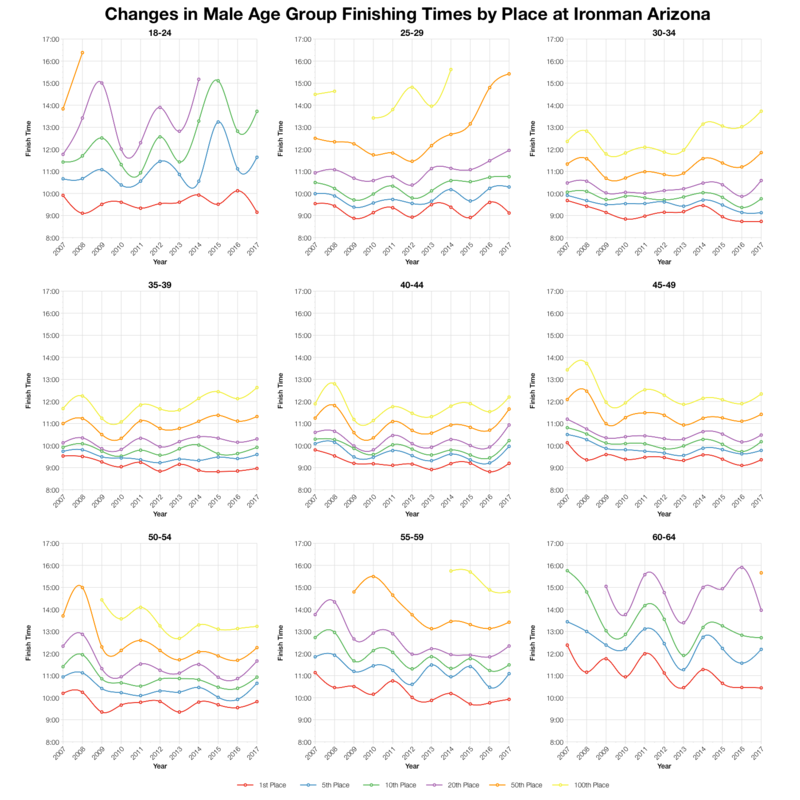 As a broad pattern the younger age groups trended slower than the course averages while the older ones were at least as fast. While the bulk of the race appears much slower this year and that is also true for some of the front of pack, it’s less clear cut. At the very front, the age group podiums, there’s not that much difference to previous years. 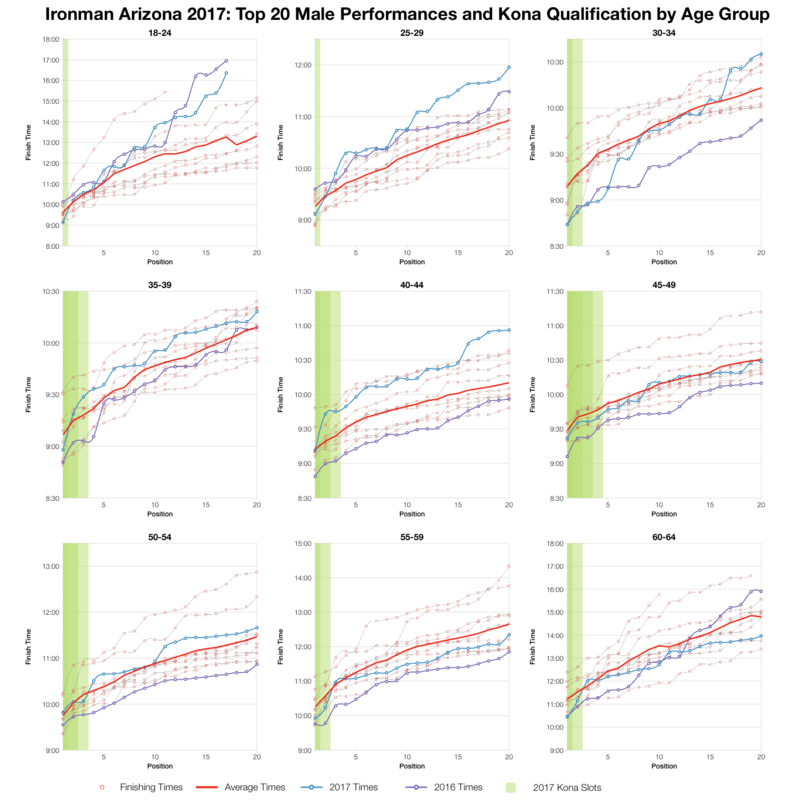 You can access a spreadsheet of the full results from Ironman Arizona 2017 on my Google Drive.